Many people suffer physical and psychological ailments due to prolonged stress or due to unresolved problems from their past. They may feel over-stressed or that they can't cope. They often have problems that their doctor can't resolve, e.g. skin problems, etc., or just feel a sadness deep inside them. Panic Attacks/Anxieties: The most common problem I see is anxiety. This can range from sudden debilitating panic attacks, to a constant feeling of danger. They can be sparked by certain situations, such as driving over bridges (very common) and, of course, there are a myriad of phobias. Even with phobias, though, everyone's problem is really unique to them. 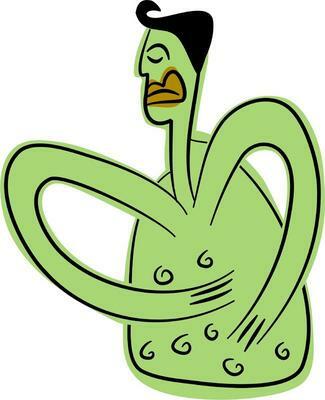 IBS can also make people very anxious - which, of course, makes the IBS worse! One distressing aspect of anxiety can be that it can sometimes feel almost like a child's fear. It feels completely alien and uncontrollable, almost as if the person is experiencing someone else's fear. Habits: People can develop all sorts of habits of thought or deed. It is very effective in helping people to lose weight. This is especially true with "snackaholics" - you know who you are! Hypnotherapy helps to change aspects about your behaviour. I don't believe in diets. Diets actually help people to fixate on food. Dieters are always working out how many calories, or points, they have to play with. If you eat lots of sugary or fatty foods; if you snack in the evenings, or when you feel "low" of bored, hypnotherapy changes the way you feel about such foods. For example, you feel full after a small plateful of food. It simply doesn't occur to you to buy or eat snacks. the really nice thing about losing weight following hypnotherapy is that you really don't feel you're having to work at all. Other Habits It can help people to stop other habits, e.g. nail biting and smoking. 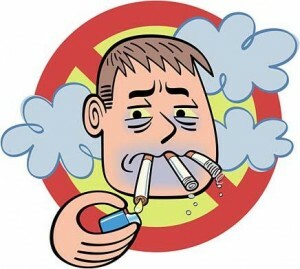 Despite what people think, stopping smoking is one of the more difficult things to do in hypnosis. Too often people are not prepared to work at it - they expect the hypnotherapist to take away all the withdrawal symptoms and, for the majority of the population, this is a bit unreasonable! You can be helped, but YOU have to be determined to stop deep-down. Another aspect of smoking is that it is an oral habit. It satisfies a deep need for comfort in the same way as a baby feels safer sucking a dummy. For many people, it is important to address this need for comfort - (why do you need it?) - and this means looking at the clients past to find out what happened that can still cause problems now. This takes time. Many clients expect to get a quick "blast" of hypnosis and ("Tara!") they're non-smokers. NB For this reason, you are well advised to avoid any therapist who guarantees that you will stop smoking. Grief: Many people feel excessive grief at the loss of a loved one, or following the breakup of a relationship. Grieving is a process that takes time, often more than family or friends think is reasonable. In the beginning, friends are very supportive, however after a few months, friends can start to get a bit impatient that you haven't started to "move on" yet". With some people, the process really does stall and sufferers simply can't stop thinking about it. That's when hypnotherapy can help. It is not uncommon for people to be "stuck" grieving for a parent or partner who treated them badly! Friends find this particularly difficult to understand. For example, friends often can't find it in themselves to feel sympathy for someone grieving for an ex-partner who was violent or abusive. Physical: The sub-conscious mind plays a major part in your the system. Whilst it may not always be possible to obtain a cure, hypnosis can assist in the relief of distressing symptoms and help subjects to come to terms with their illness and so bring about a significant and beneficial change in quality of life. Irritable Bowel Syndrome (IBS) responds really well to Hypnotherapy, especially when the underlying psychological problems are resolved. (See 'News About IBS' in the panel on the left.) Some people can be taught to ignore their pain using self-hypnosis, although this will work only in around 20% of people. Pain is worse when you are stressed, though, and significant improvements can be made by ensuring clients are relaxed and happy within themselves. Confidence: Hypnotherapy can help people feel more confident, feel better about themselves, and help them to face difficult or stressful situations. Many people start to find that they get worried about speaking in public and meetings. This can happen even to those who were previously confident. I frequently help people to perform well at Interviews and Exams. In fact, everyone who has come to me because they are worried because they are facing a "must get" job interview has, so far, always got the job! It is important to understand that, as with many things in life, there are no guarantees. As I say throughout this website, everyone is different!